If you are looking for a healthy, homemade snack, look no further than this easy homemade hummus. Serve it with vegetables for the perfect healthy snack! I love hobbies, I have many. From reading to gardening, from sewing to crochet, from soduko to snacks. Yes, snacks. I’m one of those people who needs to eat about every two hours, which as you can imagine can be a little tricky when you’re trying to eat healthy. Luckily I discovered my favorite healthy homemade snack – hummus! I have a 14 cup food processor if yours is smaller you might need to do two batches. And yes, it was a little extra work filling all those little jars, but well worth it! Now I have a set of lovely individual sized hummus in the freezer, perfect to take for lunch. Just chop up some carrot or celery sticks, or grab some chips and you’re good to go. The best part? This is fantastic hummus recipe, really good. The only thing is that it called for fresh parsley, which I was sure I had. Um…no. I had 4 bags of cilantro in the crisper drawer (!) but no parsley. So, no lovely green flecks, and I bet it would have been even better with the parsley. You are going to love having jars of this hummus in the freezer. Perfect for lunch or snaking! Combine the chickpeas, garlic, lemon juice, tahini, salt, cumin, cayenne, parsley, and olive oil in the food processor. Blend until smooth and uniform. If the hummus too thick, add 1 to 2 tablesppons cooking water or can liquid from the chickpeas and blend again. Taste, and add additional garlic if needed. Storage: fridge – covered container, 4 days; freezer – 6 months (thaw in fridge)? 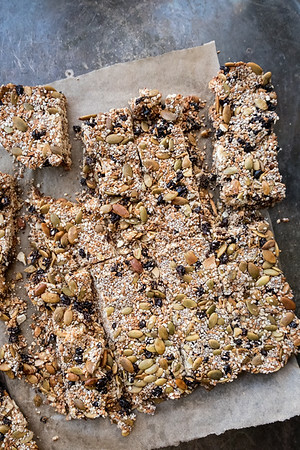 Looking for more healthy snacks? I love making home made hummus. I never knew you could freeze it though – thanks for the tip! Yum! Packing it in jars is a great idea, I could send some in with my husband to work! I’ve had it on my mind to make hummus soon, but what always holds me back is not using it up quickly enough. I never thought to freeze it, perfect solution! I never make hummus precisely because I never want much at a time–it never would have occurred to me to freeze it! Genius! Pinned! I know! It’s wonderful having it in the freezer! Love homemade hummus. I did not know you could freeze it! how cool! What a fantastic idea! I was just telling my husband I need to start making meals in bigger batches so I can freeze some. I cook every day, but sometimes I want a quick and easy meal. Really, it’s wonderful knowing I have some of this in the freezer! 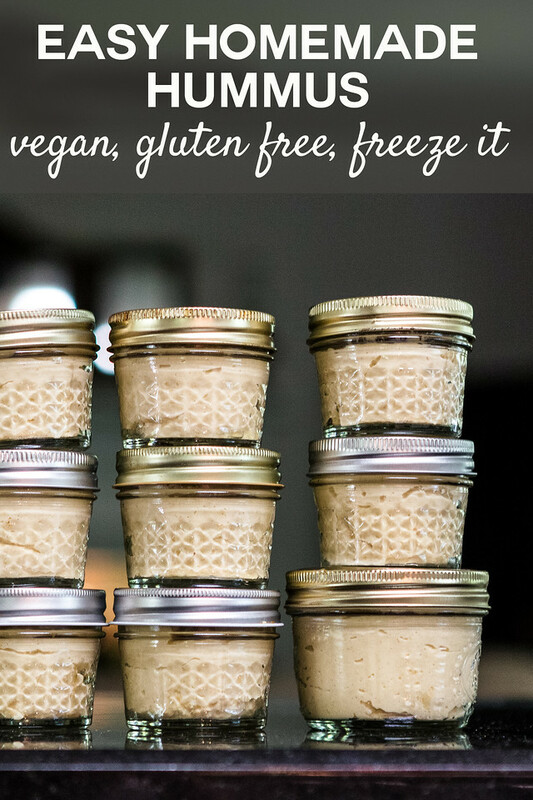 I love hummus and homemade is so much better, but as you said a little extra work, so I love the idea of freezing it in individual jars! Thanks for sharing. 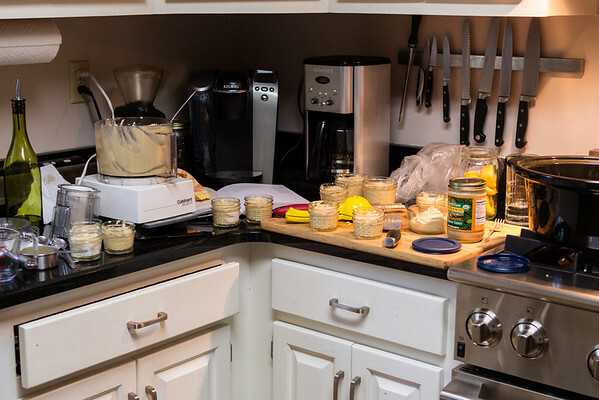 SUCH a great idea to make a huge amount of hummus – it is entirely too easy to buy my favorite brand at the store… even though homemade is so much better! this looks fantastic. Btw, you’d love undercabinet lighting. Makes all the difference in a kitchen. 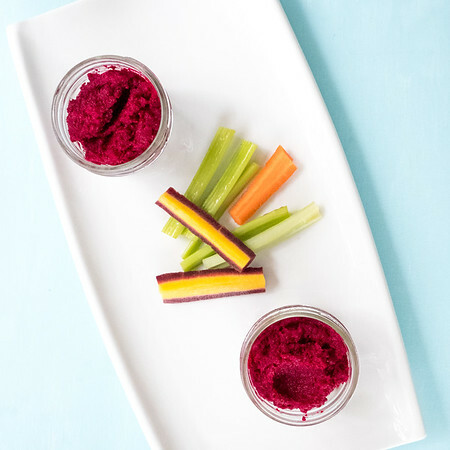 Hummus is perfect for a summer lunch for work – as you say – with crisp vegetable sticks and crackers. Brilliant idea! Can a person also can these? I’m the same way when I make a mess I might was well make it a huge mess and worth my while. I’ve found though once I start to freeze things I forget that it’s in the freezer, whereas with canning there’s all the jars in a neat little row lined up ready with no defrosting time. Oh, I hate dragging out the FP too, so I make hummus in the blender. It comes out great and so much easier to clean up. I love hummus but didn’t know one could freeze it successfully! I am going to save your recipe and give it a go. At nearly $5 for a small container, I know we will save a bunch. Problem for now… no extra freezer space! I love the jars, I guess I am late to the game learning about them, but they are so convenient. I did not know you could freeze hummus. I am not sure about the blades, but make sure you buy one with a wide feedtube. I wish someone had told me that is important. That being said I love my Cuisinart. I have started making my own peanut and almond butter. Love all your little jars. I have been making large portions of sauces lately, like espagnole. It takes hours to do so best to do it once and then use as needed. Because I did it, I can do gourmet food in 10 minutes. Great to make it work with hummus. I never thought that you could freeze it! Lovely idea for a quick snack! I like the idea of individual jars of hummus! I do feel the same way about what it will take for me to drag out the food processor. I have an ancient Cuisinart that needs replacing too. Darn – it’s hard to let it go.